The GAZE LGBT Film Festival officially opened at Light House Cinema with the Lord Mayor of Dublin Nial Ring in attendance as special guest of honour. The 26th festival opened Thursday 2nd August with the Irish premiere of 'Riot', which charts and celebrates the history of LGBT activism in Australia, telling the story of the roots of Mardi Gras - particularly timely given that nation's endorsement of marriage equality recently. The producer of 'Riot' Joanna Werner introduced the screening, along with Australian Ambassador to Ireland Mr. Richard Andrews. GAZE, supported by lead sponsor, Accenture, runs across the Bank Holiday weekend from August 2nd - 6th at Light House Cinema, where multiple Irish premieres will take place. The festival has a strand on Australian LGBT cinema, which is supported by the Australian Embassy in Ireland. The opening night's screening of Riot was attended by visiting filmmakers, special guests and dignitaries, including Lord Mayor of Dublin Nial Ring. Throughout the festival, filmmakers will be discussing their work and meeting audiences during Q&A’s following screenings of films that explore a broad range of subjects and stories. There are also multiple special events taking place throughout the festival, including Drag Queen Storytime on Saturday afternoon, and also a special screening of LGBT inclusive animation Paranorman, the festival's first ever all inclusive family screening and event. Also confirmed as an Irish premiere to screen at the festival is The Miseducation of Cameron Post, starring Chloë Grace Moretz and Jennifer Ehle. Based on the book of the same name by Emily M. Danforth, the film tells of Cameron Post, a 12 year old Montana girl, who is sent to a 'de-gaying' conversion camp after her parents die in a car crash and she is sent to live with her conservative aunt. The film will also have a special screening at Palas in Galway as part of GAZE on tour. The Lord Mayor of Dublin, Nial Ring, commented "It's a real honour to be asked to formally open the 26th GAZE LGBT Film Festival this year. Dublin has come a long way in terms of LGBT rights and visibility, and I'm proud of the city and its diverse residents for being so resilient and determined to be fully inclusive of all citizens and guests. I'm delighted to be here to support this fantastic festival which has truly gone from strength to strength over and above a quarter of a century, and it's important that the citizens of Dublin support this vibrant, crucial cultural event. I wish the festival all the best and encourage people to check out the wide variety of films on offer. GAZE programmer Roisín Geraghty said “We're over the moon that the Lord Mayor of Dublin has agreed to formally open the festival this evening with the Irish premiere of Riot. There are dozens of films screening throughout the weekend, including many premieres, and we really hope that visitors to the festival enjoy what we've put together for them. As always, I'm a big supporter of the Irish short film selection, so I'd hope that we can have a full house for those screenings." Vicky Godolphin, Managing Director, Digital and LGBT Sponsor at Accenture in Ireland said, "Accenture is delighted to sponsor the GAZE LGBT Film Festival again this year. Following the launch of the 26th annual festival at The Dock in July, it's fantastic to see Riot as the opening film of the weekend. Last year, we celebrated Ireland’s marriage equality story on opening night and tonight it is a fitting reflection on Australia's own journey to equality. Having spent many years living and working in Australia, this is a powerful story for me as it shines a light on the Australian gay rights movement at that time, and the progression to equality for Australia's LGBTQ community." Australian Ambassador to Ireland, Richard Andrews, said "The Australian Embassy is delighted to support the 2018 GAZE film festival and provide a platform here in Ireland for the stories & experiences of the Australian LGBTI community. It has been a momentous year for LGBTI rights in Australia and the historic marriage equality vote has made our country a fairer, kinder, more accepting and more equal place for all. LGBTI rights are human rights and we are a proud partner of the festival." The closing film of the festival is Love, Scott, the inspirational story of Scott Jones, following the story of this young gay musician who was attacked and paralysed from the waist down. It captures both the trauma and triumph of its character’s journey in a respectful, loving and nuanced way. The closing night of the festival on Monday August 6th will mark an auspicious occasion, as the festival has created a special award, the Vanguard Award, for a person, organisation or ally who has contributed to the LGBT community through their humanitarian efforts or through the arts. The festival is delighted to announce that Former President of Ireland, Dr. Mary McAleese, has agreed to accept the inaugural Vanguard Award in advance of the screening of the closing film on Monday August 6th. Full details of all the events are available at www.gaze.ie, where tickets are also on sale. 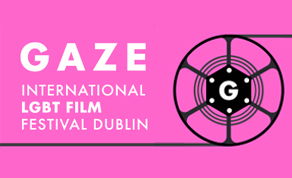 The GAZE 2018 Film Festival takes place at Light House Cinema, Smithfield, from August 2nd - 6th 2018.